It is for a very special friend who lives on the other side of the world.. Anh belongs to Vietnam, and have made Melbourne her home now. She is the author of A Food Lover’s Journey. I am sure most of you must be already familiar with the beautiful blog, the delicate photographs and recipes which feature the traditional Vietnamese cuisine as well her own creative ones. It must be quite a few years now that I have been visiting her blog and I am totally smitten by it. Reading through her blog is like enjoying a whiff of fresh summer air. It is hard for me to explain why I feel this way. But the colors of her photographs and recipes, the freshness and the simplicity and her honest writing are probably what arouse the happy feeling. It is indeed a proud moment for me to be doing a guest post for her. The way the world sees the Indian cuisine is very different from what we actually eat at home. It is unfortunate that the simple, home-cooked recipes almost never travel outside an Indian home. Most Indian restaurants all over the world will always serve the popular dishes – the ones which have already made their fame; the rich, the regal, the kind which can be described in hundreds of words to fill in the pages of the menus. There are a very few, but not many eateries out there who would want to introduce the “real” essence of the Indian home cooked food and their subtle flavors; the kind that nourishes not just the desire or the body but also the soul. Perhaps the Indian cuisine in general is too vast, and that every state has its own different cuisine with very unique recipes and flavors, adds to the complexity. Well this is of those recipes; not thought about a lot, does not command much attention, neither royal nor exotic. But it is essential, personal and interlaced with the quintessential flavors of Bengali cuisine. It reminds me to my childhood, my meals with my family, and my maa’s cooking. Only then I cared more about the toasted pumpkin seeds more than the pumpkin. Most importantly this recipe from my home guarantees the inexplicable satisfaction of basic home-cooked food. 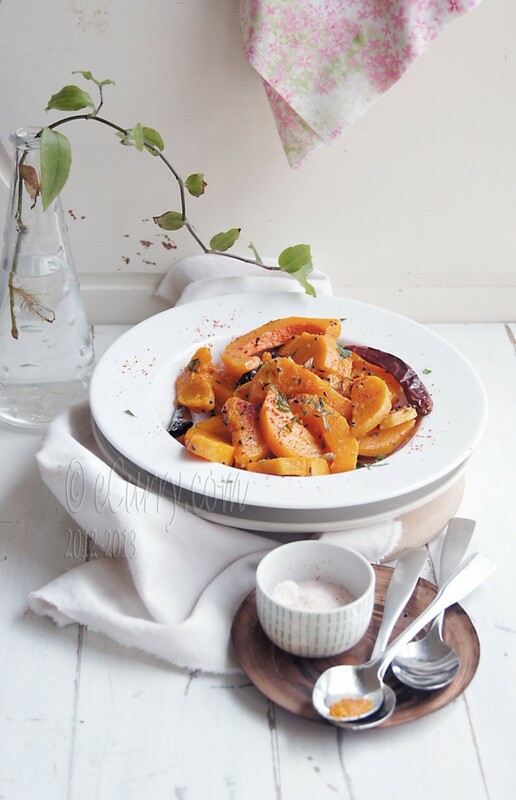 The authentic recipe used the sweet orange pumpkins. I do not get that kind very easily here. The butternut squash works just as well. 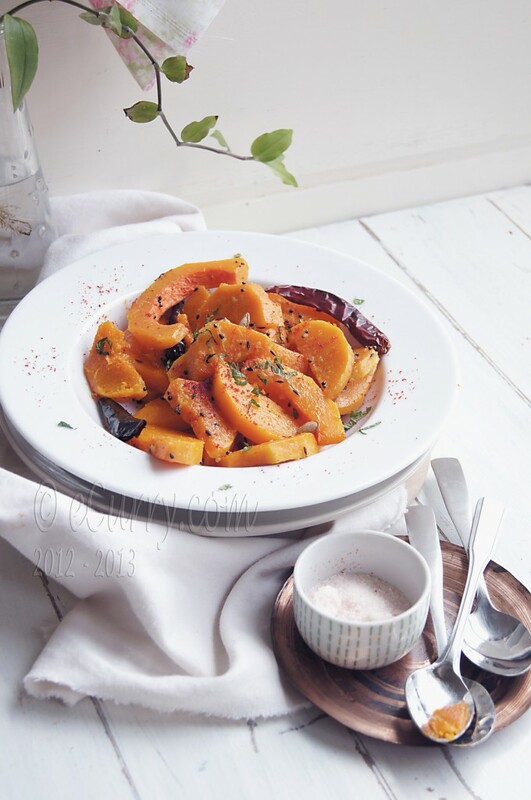 Kumro means Pumpkin, and Chenchki is general term used for a light and quickly cooked dish of one and/more vegetables seasoned with spices, usually the Panch Phoron. For me this is food with a true conscience. It reflects who we are, our life and our roots; simple, dignified and full of contentment. There should be no misunderstanding here. There is nothing really wrong with the glistening orange hued Butter Chicken or hot buttered Naan soaking up the rich sauce of the Paneer Makhani. They all represent Indian cuisine, as the ambassadors to the world. Only these are not a part of the our daily repertoire or even comfort food. When Anh asked me to do a post, I decided to feature something which I grew up eating at home. Fresh slices of pumpkin from the bazaar, or may be from a neighbor’s yard ended up in humble recipes like this. The seeds would be saved and dried in the sun to be toasted and savored. Bengalis have ingenious ways to use up every part of vegetables. Flowers, leaves, seeds and even the peels find their ways to making of unique vegetarian dishes. The result was that we sat down to a multi – course meal consisting of many sides of vegetables and of different kinds. The routine is to have them one by one with rice or roti to savor and discover each of their tastes and textures. 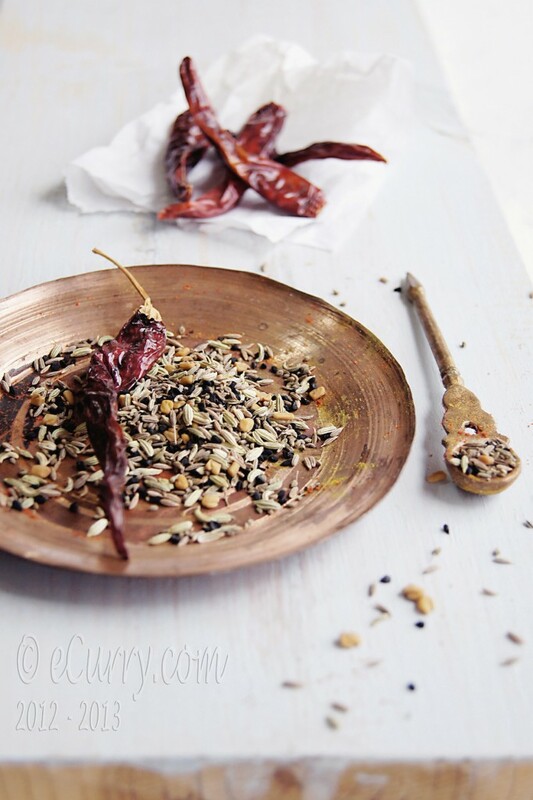 The flavors of Bengali cuisine relies on the extensive use of this spice blend called Panch Phoron or the Five Spice Mix. The spices are made to sizzle in hot oil to release the aroma; vegetables and lentils are then seasoned in the same pan. In the process of cooking the vegetables/lentils soak in the flavors of the spices. Another unique flavor is that we get from the use of the pure virgin mustard oil. Mustard oil used (and still is in some homes) to be the traditional oil for cooking and is still used to cook and season food in West Bengal. Mustard oil forms an inseparable part of the cuisine of my state; exactly in the same way as olive oil is the heart of Italian cuisine. The soil of my homeland treasures it as pure gold! Not just because of the beautiful golden color. 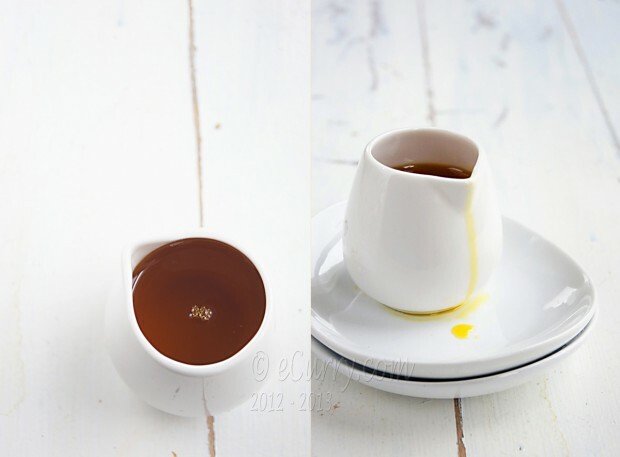 Just a little bit of drizzle imparts that sensational fragrance to the food. But I am aware that this is something that one has to get used to, to be able to appreciate the flavor or the strong sinus opening feeling! The flavor and strength of mustard oil is similar to mild wasabi! There are a couple of variations to this particular recipe. One of them is cooked with onions and similar spices, but this one I have today is the satvic version. 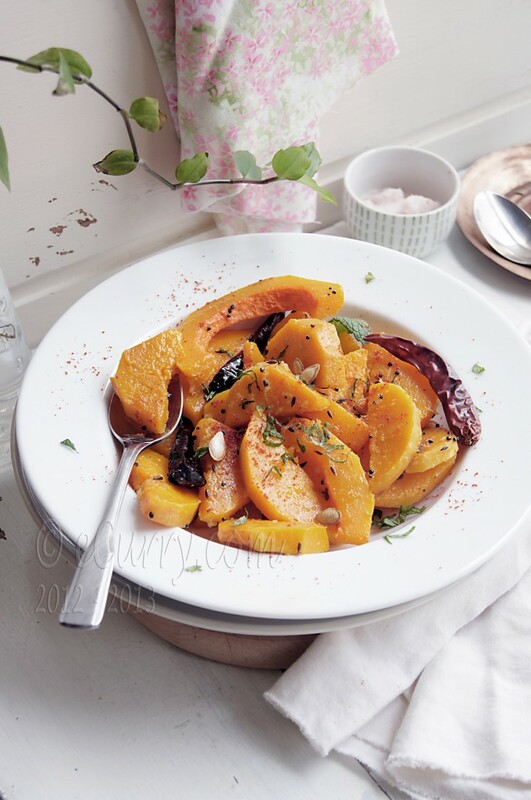 It is completely non traditional to use the pumpkin seeds in this recipe, but I like the texture and bite it adds to the dish, so I throw in a fistful just after it is cooked. Now head over to Anh’s blog for the recipe. June 19th, 2012 | Category: Dry Fries, Sides & etc. absolutely stunning pictures! 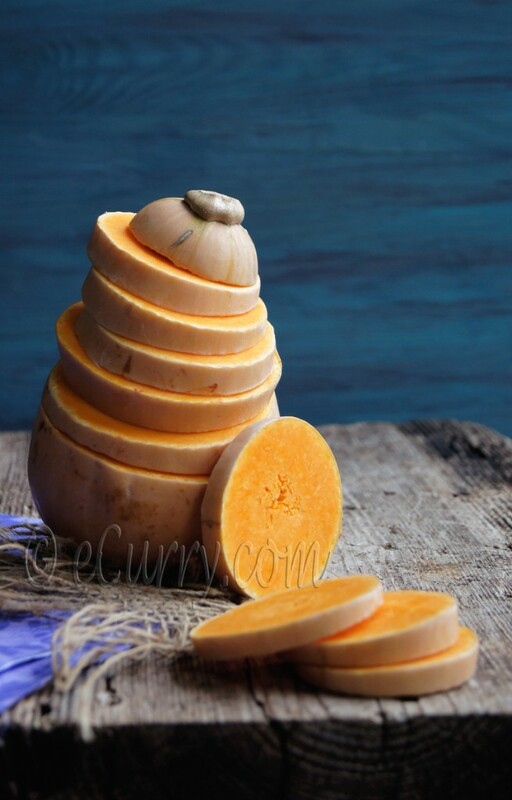 who knew pumpkin could look so glam! A lovely guest post! The pictures and dish are amazing. 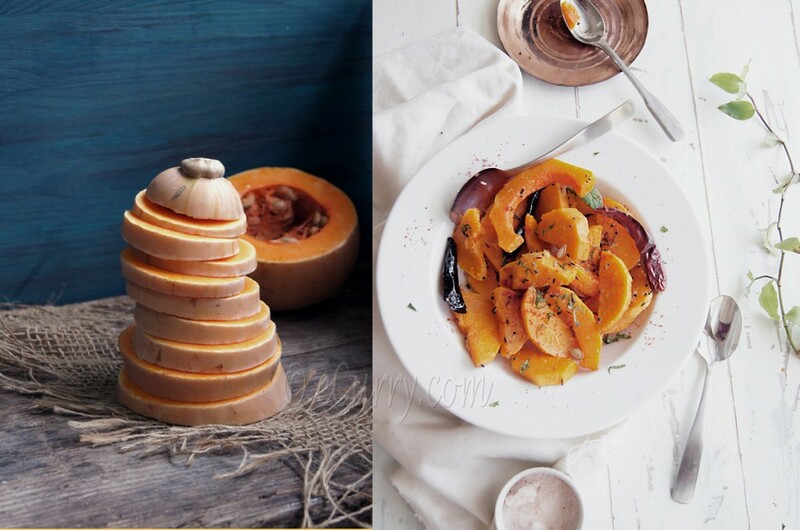 Only you can make a pumpkin look so pretty and elegant ! I’m glad you are featuring a simple home-cooked dish, rather that the usual suspects. Wow! lovely photography. And of course the dish! I love kumror chenchki and yours is gorgeous! I love Kumro. And this is a very different looking Kumror Chechki. I was expecting a ‘Ghyaat’ kind!!! Yum!! Lovely dish, I love kaddu made with sarson! Wow. You’ve outdone yourself with these gorgeous gorgeous clicks! And well the recipes sounds lovely too! Beautiful! Ki shundor chobigulo…Kumror proti bhokti bere gelo..shotti!! kanchkolar kofta baniye jemon amar kanch kolar proti bhokti bere gelo…shemni..
Gosh! What wonderful photographs. Great job and the dish? It looks irresistable. Wonderful pictures and post ! Congrats on top 9 ! This is the essence of home cooking, those recipes made over and over at home are the ones that truly reflect a culture’s cuisine. Both your and Anh’s blogs are not only filled with beautiful stories, lovely, graceful photos and incredible recipes, but you allow us to discover those wonderful home recipes. Those of us passionate about the culture and traditions behind and surrounding food, we could ask for nothing better. 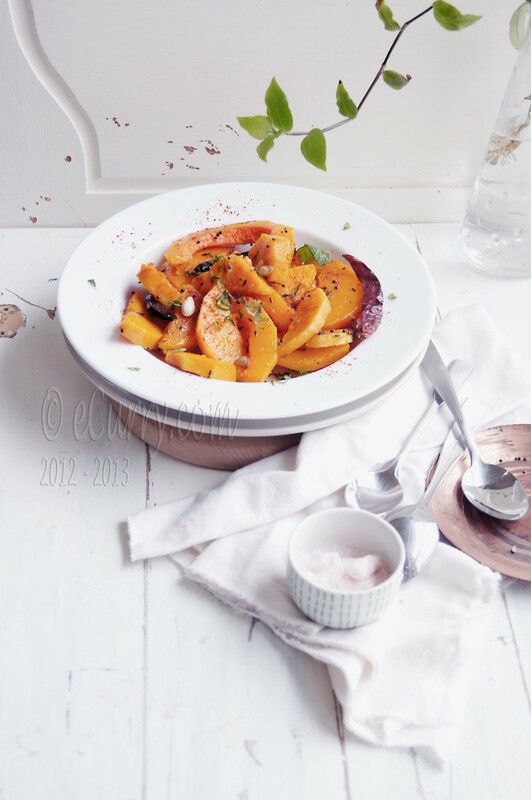 Beautiful photos and luscious recipe! never really enjoyed pumpkin but thinking this spice twist might be worth trying! The photographs certainly make one hungry to try. a very lovely blog with even more beautiful photos, glad I found you through Anh’s Food Blog. Love simple homecook recipes, it’s so comforting. those are some really gorgeoous photos. i agree with you, the simple recipes passed on from generations never make it out and those are the best in terms of health and balance. Khoob Bhalo recipe.. I did cook this at home .. it just came out tooooo yummy…..
Made it the other day for mister’s lunch (sans the pepitas) and i’m thrilled to say your humble curry stole our hearts.